Home Politics Will Woodward’s book take down Trump? Sources say: Hell No! Will Woodward’s book take down Trump? Sources say: Hell No! When President Donald Trump opens his presidential library, sometime after his second term in the White House is over, its shelves will be filled with the books that were supposed to bring him down. 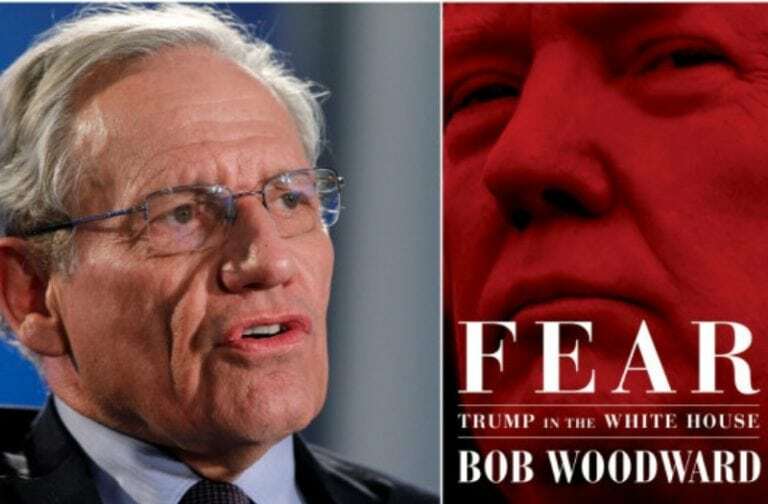 The latest addition to this future collection of literary and investigative masterpieces, ominously titled Fear: Trump in the White House, was recently revealed by journalistic has-been Bob Woodward. Like those that have gone before – amid a fanfare of certainty that Trump was toast – Woodward’s effort will join the list of books that never changed the world and the titles of which we cannot recall. Much like a ‘70s rock band that finds new life on the casino circuit in Las Vegas, Bob realized that this was his last hurrah: His last Harrah’s – if you will. Pining for the glory days, when he was hailed as the king of investigative journalism – and stricken with Trump Derangement Syndrome – Woodward crafted a story of little substance. To borrow from Shakespeare; it is a tale told by an idiot, full of sound and fury, signifying nothing. But, hey, it’s Bob Woodward, so it must be true! Furiously hitting the talk-shows but, thankfully, not flinging his underwear at screaming, middle-aged fans, Woodward enthusiastically touts the claims he made in his book. Trump, he says, is “detached from reality.” There appears to be no compelling evidence offered. In the closing weeks of World War II, Adolf Hitler – who was, literally, Hitler – would move pieces around on a huge map table as his senior officers looked on, shifting uncomfortably in their shiny jackboots. Those pieces represented German divisions that had already been destroyed by Allied forces. That, Bob, is being detached from reality. When leftists say someone is detached from reality, what they mean is that the someone in question is refusing to do things their way. It is the more diplomatic version of calling someone a racist for thinking foreigners should not be able to enter the country illegally. Leftists are simply unable to differentiate between reality and their ideological vision of how the world should be. There is a way to describe this condition; it is called being detached from reality. Woodward also claims that the president composed a tweet that would have sparked a war with North Korea. In a CBS This Morning interview, Bob claimed the never-posted tweet said the U.S. was going to pull all family members of military personnel out of South Korea. He went on to claim that, according to his “reliable information,” this tweet would have been seen by North Korean leader Kim Jong Un as a sign that the U.S. was preparing to attack. The tweet, Woodward says, was not posted because the Pentagon advised against it. Clearly, there are a few holes in Woodward’s story – quite apart from the lack of evidence and lack of identified source. Does the president seek the Pentagon’s counsel before tweeting? Why would the Pentagon object and would Trump have acquiesced? It is not in the realm of possibility that the U.S. military could have removed some 70 to 80 thousand civilians from South Korea without their nosey northern neighbors quickly figuring out what was happening. Additionally, the likelihood that such a move would have led to a swift military response from North Korea – on a scale that would have made war unavoidable – is remote. Woodward’s little story, much like the man himself, appears shaky, at best. The former journalist also claims that Trump is jeopardizing national security and that his White House staff is generally sweating buckets, trying to rein in this madman. As is the case with previous books written for the purpose of destroying the Trump presidency, this latest one provides no verifiable sources to corroborate any of the claims made. 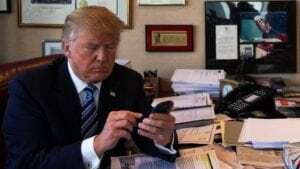 In a tweet that the Pentagon failed to intercept, Trump himself called the Woodward’s book a joke, adding that it relied on “now disproven unnamed and anonymous sources.” The president also said that he would “write the real book!” Doubtless, it would be a far more entertaining read. With a little over two years until the president “Hillarys” another challenger, America can anticipate several more such books by the new heroes of the Resistance, such as Stormy Daniels, Michael Avenatti, Colin Kaepernick, Ron Perlman, Alexandria Ocasio-Cortez, and some guy who was kicked off a Trump golf course in 1997 for wearing open-toed sandals. The steady stream of anti-Trump books – a tree holocaust – is little more than fodder for the gossiping gaggle of legacy media moonbats. As each is released and dissected, the nation shrugs, the markets shrug, and the president continues to produce results, despite his alleged satanic psychosis. The Donald J. Trump Presidential Library is going to stand as a monument to a string of petulant, publicity-hungry nobodies who each thought that they would be the one to end the era of Trump. Read More – Will Woodward’s book take down Trump? Sources say: Hell No! at Liberty Nation.